SYRACUSE, NY -- When Syracuse threatened one final time, Joel Berry II had an answer for North Carolina. "We made some dumb plays," at the end of the game. "I knew he wasn't a solid player when it came to holding onto the ball," Berry said. "I saw through the span of the game his teammates were throwing it to him and he was losing the ball, so when he put it down it was like, 'This is my opportunity to grab it,' and so I just pulled it out and I got it." "We did everything we could to get back in it," Syracuse coach Jim Boeheim said. "These guys played their heart out. They have all year long. We did everything we could offensively to win. When you're tied, you can't make a turnover in that situation." "We just have to do a better job closing out games," said Battle, who had 26 points but missed all five 3s he attempted. "Just missed a couple of shots at the end. We had the game won. We just gave them the ball, gave them plays." 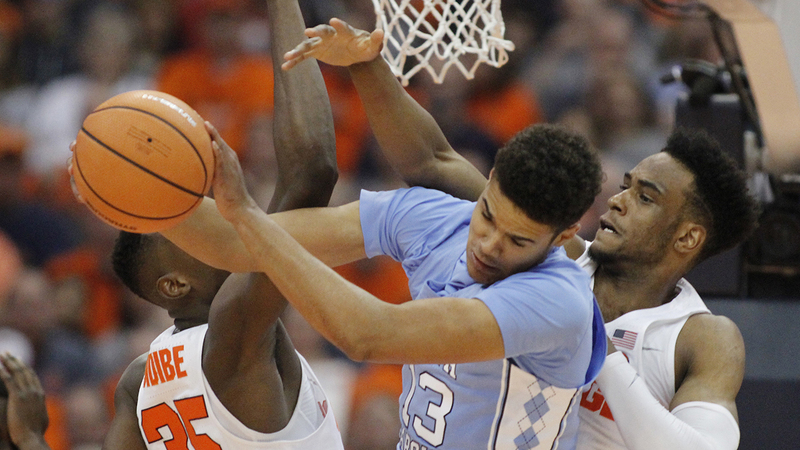 North Carolina's Luke Maye, right, grabs a rebound from Syracuse's Bourama Sidibe on Wednesday. UNC built a double-digit lead early and every time Syracuse threatened the Tar Heels had an answer. Berry hit a 3 after Battle's drive had made it a one-possession game, 51-48 with 14:33 left. When Chukwu lost an offensive rebound seconds later, Pinson roared in for a slam at the other end. "They're fighting to get into the tournament, so you knew they were going to keep coming at you," said Pinson, who had seven assists. "They fought the whole game and I know they wish they had this one." Pinson's three-point play midway through the half gave UNC a 61-51 lead, but the Orange weren't through. Battle's driving layup moved Syracuse back within 68-64 with 6:32 to go as the season-high crowd of 27,165, largest in the nation this season, shook the Carrier Dome walls. Howard missed a 3-pointer with 17.2 seconds left and Berry's two free throws iced it. Syracuse: The Orange still have games against Boston College and two ranked teams - Duke and Clemson - as well as the ACC Tournament to bolster their resume for the postseason. UNC used 10 players in the first half and seven scored as its bench held a 13-2 edge over the Orange's reserves. High scorers were Maye and Manley with 8 apiece, Pinson with 7, and Berry 6. As usual, Battle, Howard and Brissett played every minute of the period for the Orange.